ALAN STUBBS today insisted Hibs can clinch second place in the Championship table by winning all seven of their remaining matches. Rangers closed to within three points of the Capital club by beating them last weekend and the fact Stuart McCall’s side also have a game in hand – albeit against champions Hearts – has prompted talk of the race for second having swung in favour of the Ibrox outfit. Stubbs, however, rejected any suggestion his players were now the underdogs, the head coach saying: “We have beaten Rangers three times this year so we know we can beat them. At this moment, we are in second so if, we were to win all our games then we would stay in second and that’s what our aim is. “We also have a goal difference of plus six and that in itself is the equivalent of a point if it comes down to that. We’ll just have to wait and see. It was a good result for Stuart, a good result for his team but I don’t think we played badly, but nor do I think we played well. I honestly didn’t think there was a lot in the game. 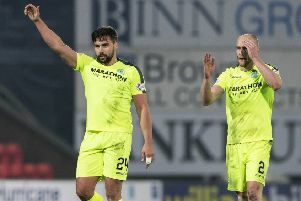 “The goalkeepers did not have a lot to do but the fact of the matter is we lost so we move on to Raith Rovers tomorrow.” To that end, Stubbs believes seeing their 15-match unbeaten run end will have refocused his players on what’s needed over the closing matches of the season. He said: “Obviously, we wanted to win last weekend – we want to win every game. “But I think if we had won it then all the eurphoria is you have beaten them four times in the league and that can lead to players taking things for granted, that you have a hoodoo over someone although I don’t believe in anything like that at all. And Stubbs believes Raith, following their 3-0 win over Queen of the South, will provide the perfect opportunity for his players to bounce back from last weekend’s setback. He said: “Raith have done well recently, going by reports from their game against Hearts they were a little unfortunate, it could have gone either way. The game against Queen of the South during the week was impressive, a great result. Queens have done great this season but I think that’s what Raith are, on their day they give the top teams a real game and I do not see anything different tomorrow. “I think it’s a good game for us, one you need after a loss and I think it makes sure the players have to be on their mettle. Stubbs expects David Gray to be fit, the right back failing to reappear for the second half against Rangers having picked up an ankle injury while Danny Handling will be in the squad despite having started last night’s match for Scotland’s Under-21 side in Hungary. So, too, will Farid El Alagui, the striker on the point of a return after almost seven months out after rupturing his Achilles tendon. Jason Cummings should also feature, a scan on the knee injury sustained against Cowdenbeath having shown no serious damage. The teenager trained yesterday and, if there was no reaction, he was expected to do so again today, brightening his chances of facing Raith.